A couple of weeks ago I picked up a few of the nuts; they were too fresh and tempting to leave behind. When I got home and was considering roasting the harvest (don’t be silly, in a convection oven) they were diverted into a centerpiece for the table in the sunroom. 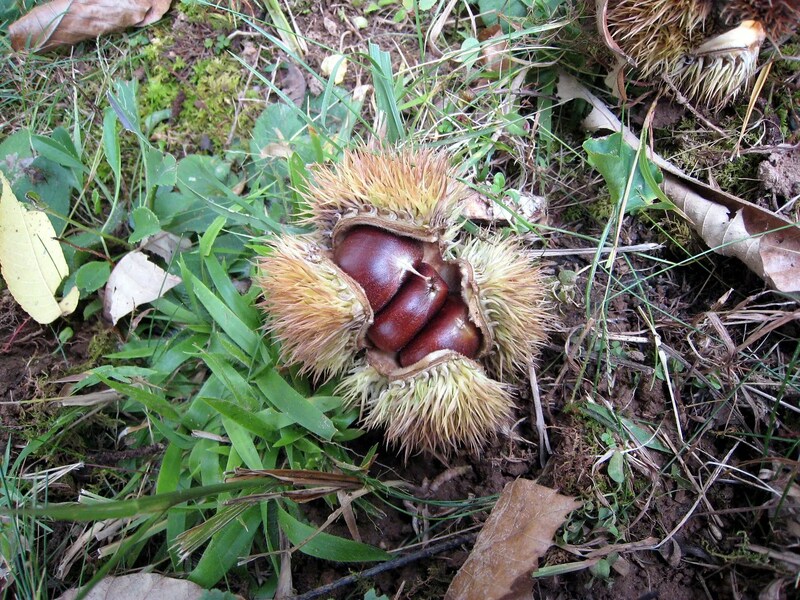 Well, along the way I read about chestnut weevils while researching the right way to harvest and prepare fresh chestnuts. 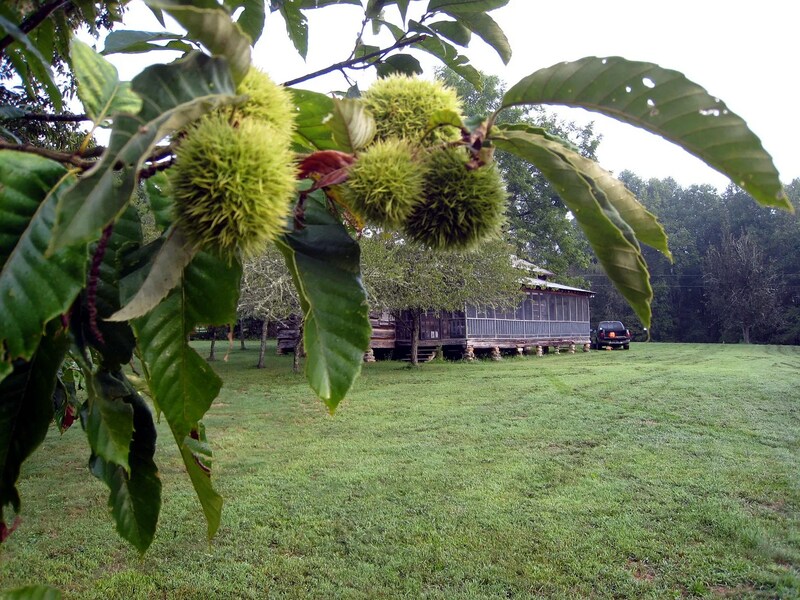 I didn’t think much about them since my chestnuts were so freshly picked up and most certainly unaffected by this little pest. Before I post the graphic evidence of the above mentioned “not cool” bowl o’maggots, I’ll provide this link explaining the life cycle of the guilty party: The Chestnut Weevil. The freshly hatched culprits don’t have the wings of their parents yet so the larvae drop down to burrow into the ground for the winter. 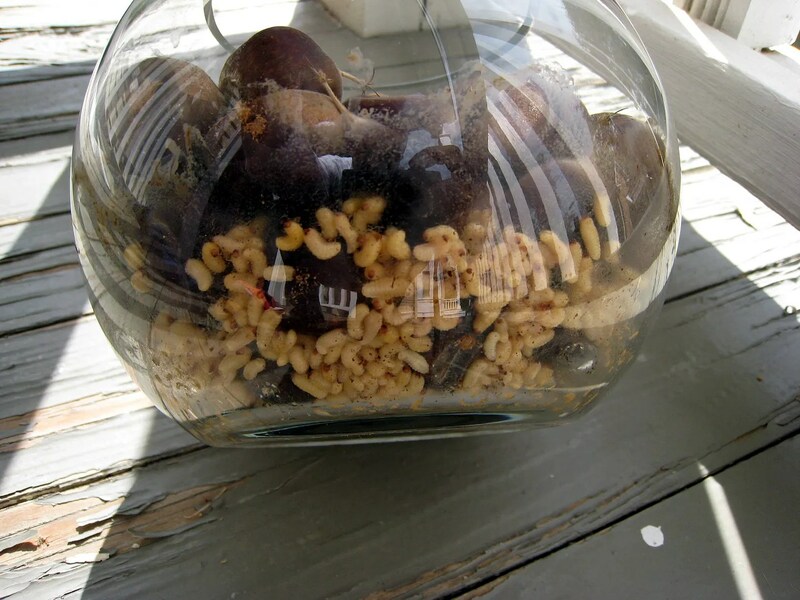 The only problem is these nuts were no longer lying on the soft ground of the north Georgia mountains, so the wiggly whitish maggots collect in the bottom of the bowl. I wonder if I managed to pick up any nuts that weren’t carrying the evil weevil demon seed? What gave it away? The noise of the maggot conference wiggling away in the bottom of the bowl searching for the cool ground below. Sometimes nature is just plain disgusting, isn’t it? 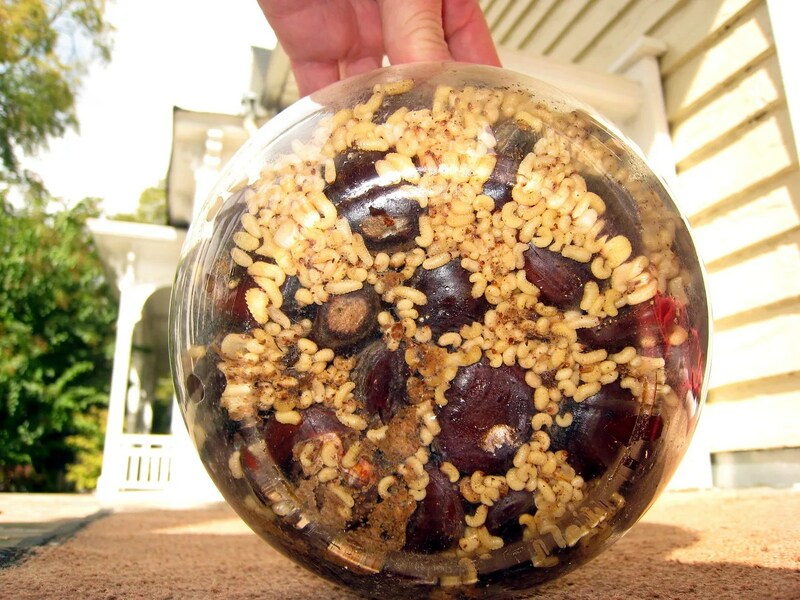 So can you freeze the fresh nuts or otherwise treat them to prevent this? Or is the damage already done internally? “They say” the key is to pick them up immediately and avoid the egg laying altogether. I’ve read also where a 120 degree water bath will prevent the eggs from hatching without ruining the quality of the nut meat or the germination rate if used for seed. Googling chestnut weevil gives lots of related content that I didn’t dig too deeply into. 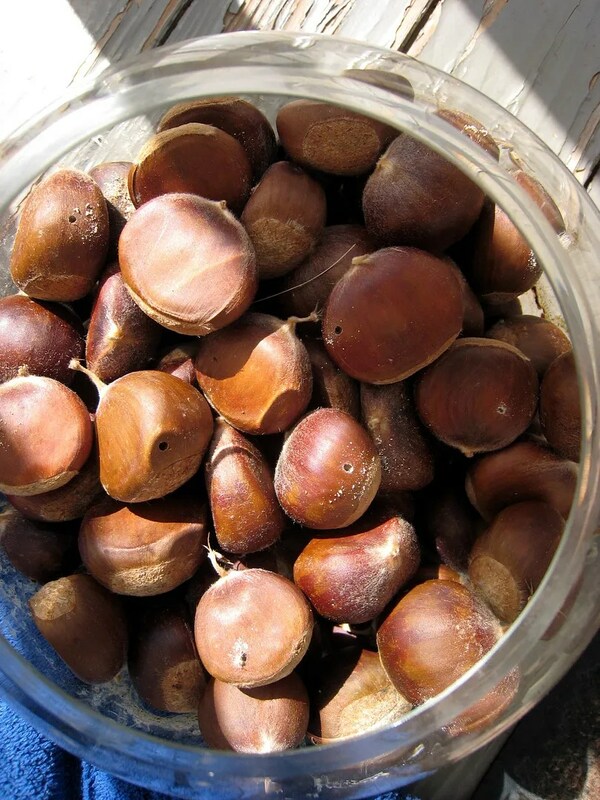 I decided after this I won’t be eating any chestnuts for a couple of seasons. Ewww, I can’t believe you posted those pictures!! That is seriously gross stuff my friend. Hopefully you’ll have better luck net time you harvest. This is why my decorating skills are legendary. 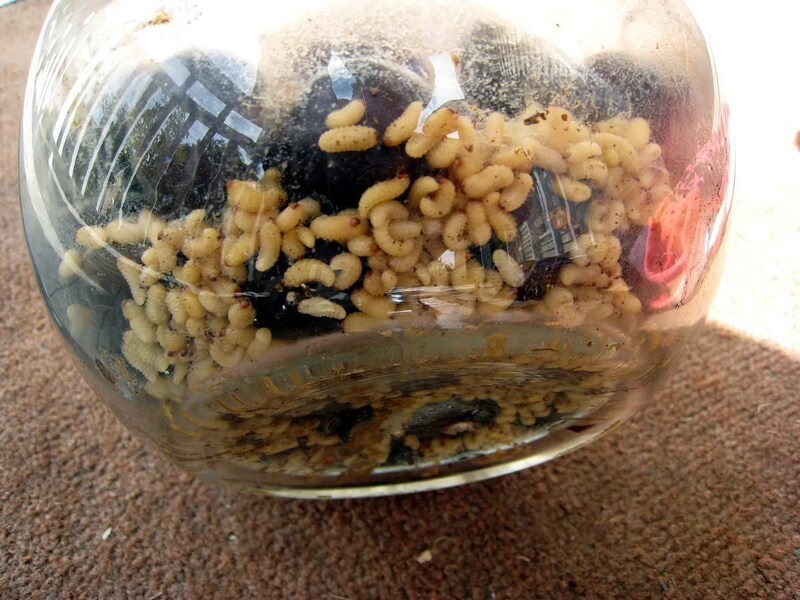 Who else would have a bowl of maggots for a centerpiece? Trendy decor that transitions into a compact petting zoo. 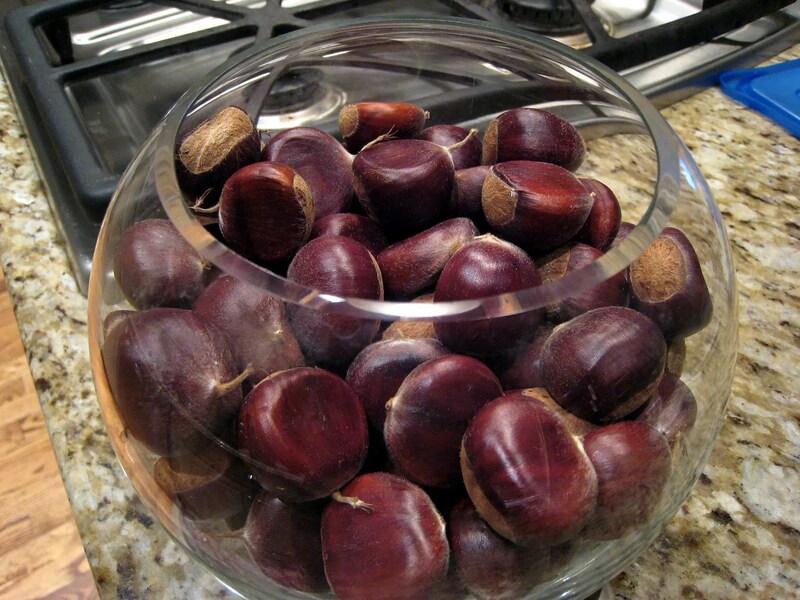 So if you pick up the chestnuts and immediately roast them on an open fire (such as a charcoal grill), are they okay for eating? Do the eggs simply add flavor to the mix? (This is an important question, since I did this about 10 days ago!). Their gestation period is about 2-3 weeks, so maggots should be gnawing their way out of your torso any day now. I think you should raise them to help with healing. Maggot therapy (also known as maggot debridement therapy (MDT), larval therapy, larva therapy, larvae therapy, biodebridement or biosurgery) is a type of biotherapy involving the intentional introduction of live, disinfected maggots (fly larvae) into the non-healing skin and soft tissue wound(s) of a human or animal for the purposes of selectively cleaning out only the necrotic tissue within a wound (debridement), disinfection, and promotion of wound healing. Sorry PIt, all that maggot talk got the spam filter all riled up and I just now discovered your comment was in time out. Gotcha. I can see where a “Spam” filter would not like maggots. This was very interesting. Your pictures tell a good story. 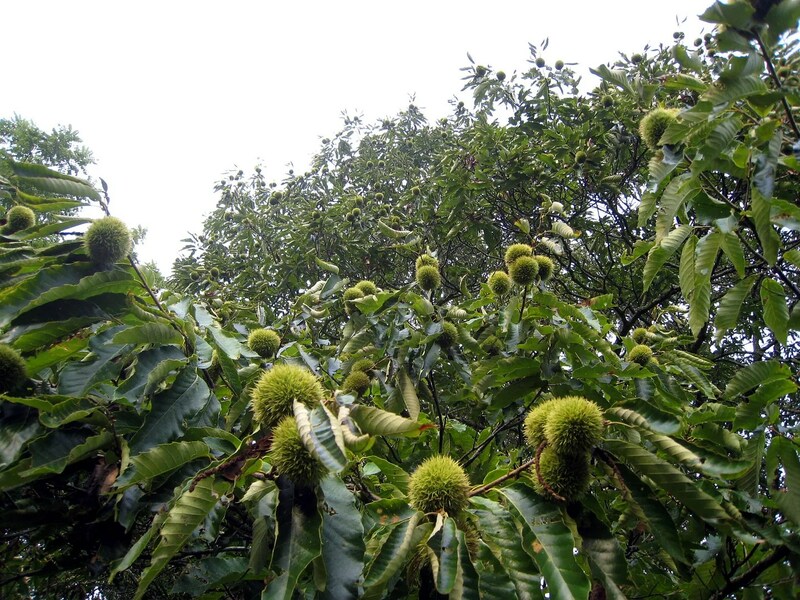 But it is also very scarey for us because we have a orchard of Chinese chestnuts that we grow and sell. I was hoping to find the complete life cycle of these little pests. We don’t have them yet, but if they do find there way to Michigan I hope that we can prevent them or deter them before be add extra unwanted protein to our nuts! Check with your state agriculture extension service, they can help you. Basically you have to break the cycle. Too labor intensive for me with my trees 80 miles away…..
Whoaw! This is why people pasture chickens in their orchards, you’d have some very happy chickens.